I created a group on LinkedIn called “Give Us More Groups.” What’s ironic? Well, I had to leave a group to create the group. Also, so have all or most of the members. What else? LinkedIn sent me group alert. Really? There are a TON of groups I would LOVE to join. Why? Am I a spammer? Apparently, as long as I blog there are certain people who think so. (Or rather there is one individual who is speaking for some unidentified population of people he assumes shares his opinion.) Apparently there are some (or at least one) who feels that blogging and “serial” sharing has “absolutely zero engagement,” and, therefore, is as good as spam. I wonder, though how they (he) keep up with emerging trends in their (his) industry? I wonder how they (he) decide which services and products to trust. I think you’ll agree that our professions require us to be very dynamic in order to be effective. We should be immersed in marketing groups, business development groups, social media groups, various industry groups, unemployment groups, recruiting groups, human resources groups, and on and on. You must be aware of just how many job groups there are alone! (35,638) I don’t think we should join all of them. Actually, I share your point-of-view about having quality interactions versus harvesting contact information. 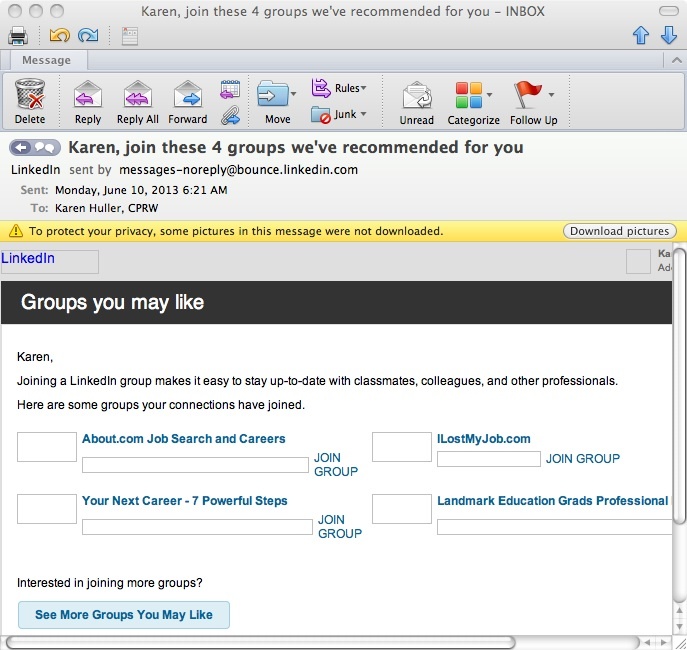 I even have a vlog about it: http://bit.ly/chavlog2 – Why not to accept LinkedIn invitations from people you don’t know. I cannot speak for the people who have spoken to you about their intent to “harvest” more connections, but doing so seems to be explicitly written into the purposes of LinkedIn: to “meet, exchange ideas, learn, make deals, find opportunities or employees, work, and make decisions in a network of trusted relationships and groups.” A lot of people misunderstand my intent with my vlog; they think I only want to connect with people I already know. That is NOT the intention of LinkedIn. I want to know my connections AND invest time in getting to know new people BEFORE they join my network. I think what you are concerned about is that people will skip the critical step of building relationships with people they add to their network or that they will simply add these contacts to some large SPAM database, which would go against social networking, networking, and business development best practices. Furthermore, if part of the mission of LinkedIn is to learn, it can also be understood that part of the mission is to teach. Rarely do I promote a product or service on LinkedIn, and when I do I use the appropriate channels. I very often, however, use it to disseminate news, advice and FREE resources to my target audience. Even this is not welcome in some groups, and I respect that. The whole reason LinkedIn has an interest section is so that people can find common ground, an impetus for building rapport. That is why there are groups related to personal interests and professional interests alike. Once you have something personal to share, creating professional synergy is that much easier. My life is as diverse as my profession. I want to engage with professionals who are also musicians, like me. I want to share my passion for my sports teams with other people on LinkedIn. I want to learn tips from other work-at-home parents. I need to connect with other real estate stakeholders to get deals done. I want to know what mistakes people are making in their investments that can save me from losing my shirt. I want to be able to be a part of local political issues. I’d like to know what other people who are trying gluten-free diets are craving, and how they overcome it. There was more, about how LinkedIn groups could really help me facilitate enrichment exchanges with diverse groups. This is something I see Google+ doing better than LinkedIn, and could be a reason people turn to it rather than LinkedIn. For us as users, there is no problem in using various social media for different purposes, as long as our desired communities adopt the same social media. However, for any social media platform, you have to know your audience and capture as much of their time as possible for growth stability. This is where I think LinkedIn is failing. In many ways, they have hit a peak and are leaving plenty of room for a new, better, more powerful platform to emerge and take over as the professional social media of choice. 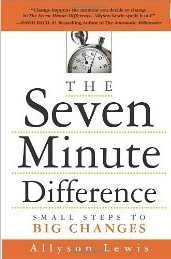 A book was recommended and lent to me, The Seven Minute Difference: Small Steps to Big Changes, by Allyson Lewis. You know I like to share what I learn, so while I haven’t finished, why wait passing on some nuggets of wisdom I have already gained? What the author highlights is how you can move inches closer to your goals every day by dedicating what is completely reasonable to – 7 minutes. Every day, no matter how busy we are, we can find 7 minutes to make our futures a priority by doing what are called micro-movements. The artist Sark writes about practical ways that you can infuse your life with creativity and be an artist, and she first introduced me to micro-movements. I had forgotten how great micro-movements can be, especially when completing a project or achieving a goal seems insurmountable or overwhelming. I thought I would share 5 micro-movements that you can do TODAY that should take about 7 minutes and will move you closer to your dream job and/or move your dream job closer to you. Answer the following questions. I have found that it is best to suspend any thoughts that you might have about whether your answers are realistic or not. Consider this a stream of consciousness exercise, where you just let the thoughts flow. Do not judge them. Just record them to refer to later. 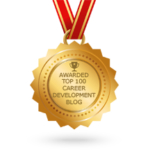 #1: Taking into consideration your skills, experience and passion, what is the greatest contribution that you could make if you knew that you would be paid well for it? #2: What new skills and experience could you gained that would help you make the contribution even greater either in scope or in the number of people impacted. #3: If you could handpick your boss, what qualities would he or she possess that would motivate you to achieve your highest potential and what kind of experiences would they have already gained that you would like the benefit of learning from? #4: What kind of people would you like to work among? #5: Where do these people go to feed their own passions where you might be able to meet them and pick their brain about potential companies? That’s it. Just answer the questions freely – nothing too difficult or overwhelming. I’m not telling you to go and do anything with these answers – YET. When you are done, come up with your own next 7-minute micro-movements that can take you even further. 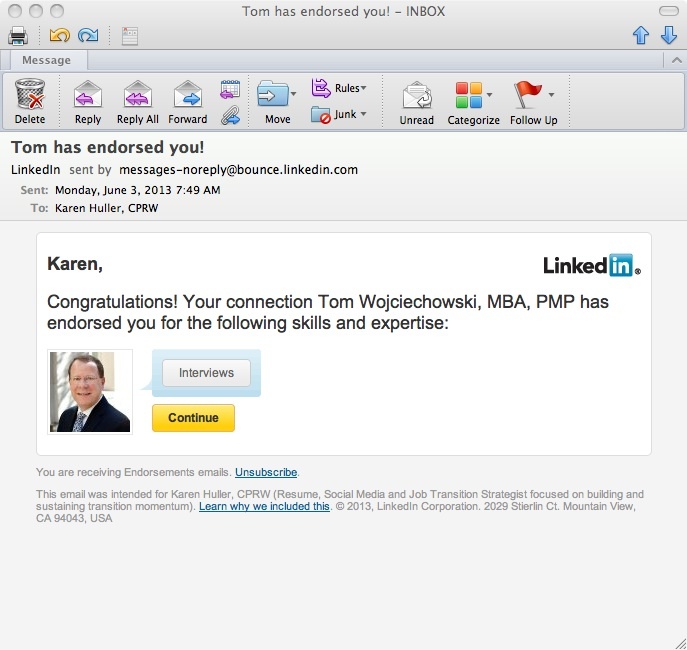 What is the etiquette with LinkedIn endorsements? You are a linkedin guru so maybe you can offer some advice. Without solicitation by me, people have endorsed me for Oracle Applications. Why are they doing it and what is the proper etiquette. Should I send a thank you? Should I return in kind an endorsement? Endorsements have a fraction of the meaning to visitors as recommendations, but they have proven to have some influence on your credibility. A lack of endorsements has more of a negative influence on your credibility than having endorsements has a positive influence on your credibility; they are so easy to give. You may notice on your home page at the top you are prompted to endorse your connections. Your connections see the same. LinkedIn offers suggestions as to what to endorse you for based on the skills that you chose to include on your profile. All your connections have to do is CLICK and you are endorsed. You don’t have to reciprocate directly. It is best to be genuine. It is considered thoughtful to endorse someone, and it might brighten someone’s day to have you endorse them. As mentioned in my last vlog, how you make people feel is paramount to what they are willing to do on your behalf. Doing so also keeps you visible and top-of-mind to your network. A thank you, whether private to each individual or public as a status update, is always a nice idea. So, while reciprocation and thank yous are not obligatory, they are reflection of your gratitude and can be a positive reflection on you as well. Just stay genuine and don’t go overboard.